The Power Of Habit claims to be a book that is key for the reader to learn how to make good habits. Such as habits to help a person to exercise, lose weight, raise children, and build a business. 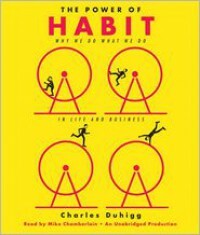 Author Charles Duhigg describes that making smaller good habits will help change the bad ones. I listened to the audio version of The Power Of Habit. I thought maybe listening to the audiobook my brain would able to absorb what needs to be done to create some good habits. Some of the stories were interesting including the one about Starbucks and others. As I listened I realized that most of the book was really talking about examples of how others changed or already had habits and how they kept or change them. Which was sadly not what I was looking for. I guess what I wanted was a workbook with The Power Of Habit. I wanted to know where I begin not how someone else did. I needed a little more guidance. This was the first self help book I listened to on audio and I think I will be doing more non-fiction by audio. Even though this is not what I was looking for it was still a interesting book.